This Fig and Fennel Seed Sourdough Bread takes a couple of days to make, but you are rewarded with two loaves of fragrant and fig filled bread. 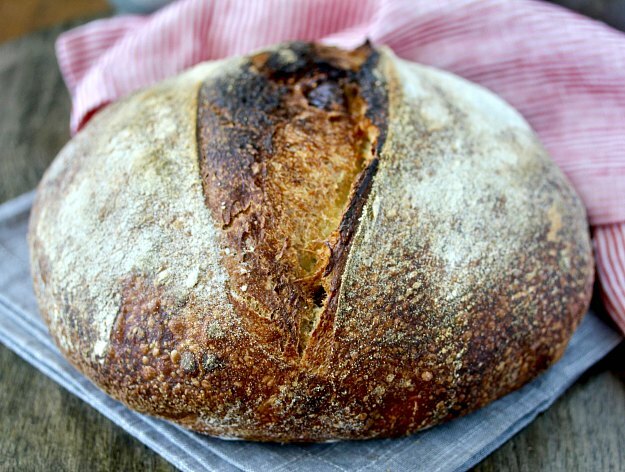 This bread begins with a stiff levain that you make from a liquid sourdough starter. Next you mix the dough in stages, throw in a few stretch and folds, and then shape the dough over a period of several hours. Once you've shaped the loaves, you refrigerate them overnight and bake them the next morning. I baked these loaves in preheated cast iron Dutch ovens, but you can also bake them on a pizza stone with a steam pan. I am so excited about how well this bread turned out. It has been awhile since I've posted a sourdough bread and I've really missed the process. It's so relaxing and therapeutic. I used organic dried figs that I briefly rehydrated by soaking in warm water. If your dried figs are super moist, you can skip this step. This recipe was inspired by this bread from The Perfect Loaf. I changed up the flours, messed with the starter hydration percentage, and added some diastatic malt. His post is a great read, and the story about his father trying to maintain a fig tree is adorable. The ground fennel seeds in this bread add such a lovely sweet fragrance to the dough. If you can, be sure to grind whole fennel seeds yourself. I finally bought a spice/coffee grinder for grinding whole spices. I love this Krups spice/coffee grinder for grinding coffee, so I got the same one for spices. If you have a mortar and pestle, that will work too. I added a little diastatic malt powder to this dough. It's an optional ingredient and really helps with a long fermentation. You can read more about it in this post about baguettes. One of the homes I lived in while growing up had a small fig tree clinging to the side of a fence. At the time, it seemed like everyone here in southern California had a fig tree, and we all took them for granted. I remember the figs ripening but I have zero recollection of actually eating the figs. I'm not sure if my parents let them die on the tree or gave them away. We also had two avocado trees and never ever ate an avocado from those very productive trees either. My memory is hazy (this was x-hundred years ago), and both of my parents are no longer around to ask, but I'd love to know what the deal was with those avocado trees. P.S. I did spend a lot of time climbing both of those avocado trees with my sisters and cousins. There was even a pole holding up one of the large limbs that we would slide down after climbing out over the limb. Back to the bread... what schedule should I follow to make this bread? Day one: 10 am: Mix the levain. 1 pm: Autolyse. 3 pm: Mix the levain and salt. 3:10 pm: Soak figs and grind fennel seeds. 3:40 pm: First stretch and fold. 4:10 pm: Add the fennel and figs and do the second stretch and fold. 6:40 pm: Pre-shape the dough. 7:00 pm: Shape the dough and refrigerate. Day two: 7 am: Score and bake. What the heck does autolyse mean? You're not a bread geek? That's the process of soaking the flour with the water before mixing. It helps the flour absorb the water before adding the rest of the ingredients. I hope you'll try this bread. For more information about using your sourdough discard and refreshing your sourdough, check out this post. Do you have more bread recipes with figs? Yes! 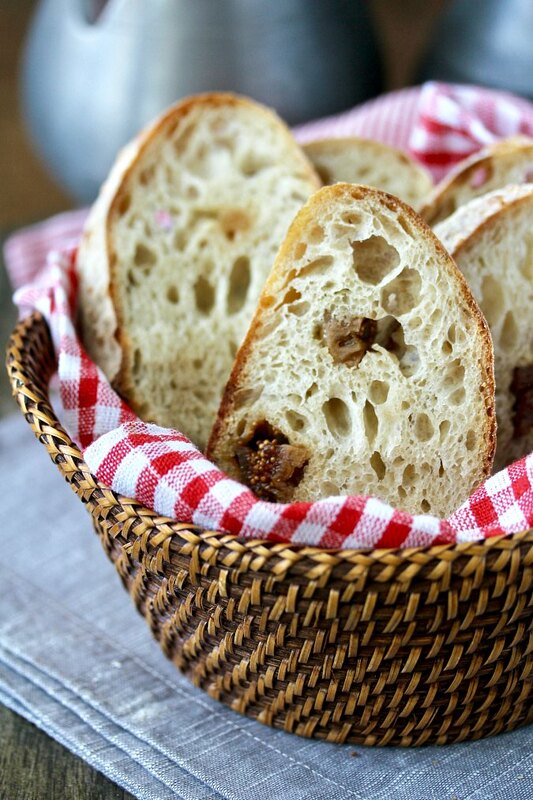 Be sure to try this Fig and Walnut Bread. It is not a sourdough bread. If you are a bread geek like me, check out this Sourdough Barley Bread with Figs and Pecans. P.S. If you have fresh figs, you must try this fig margarita. After the recipe, be sure to check out the rest of the Progressive Eats recipes containing figs, hosted by my friend Colleen of The Redhead Baker. Mix the whole wheat flour, liquid starter, and water in a medium bowl. Cover and let rise for four to five hours in a warm place. About 2 hours before the levain is ready, in a large container, mix the bread flour, all purpose flour, diastatic malt, and 800 gram of the water by hand to fully incorporate. Cover and let rest for two hours. Take the stiff levain and break it up into pieces and add it to the dough. Add the rest of the water and pinch and stretch and fold the dough to fully incorporate the levain. Let the dough rest for 10 minutes and then add the salt. Pinch the dough to dissolve the salt and then stretch and fold some more to incorporate and develop the gluten. Cover and let rest. After 30 minutes, stretch and fold the dough again. Soak the figs in warm water and then quarter them. After 30 minutes, add the figs and fennel seeds to the dough and fold them in to fully incorporate. Let the dough rise for an additional 2 hours and 30 minutes, until the dough has risen about 50 percent. Scrape the dough out onto your work surface. Divide it into two and preshape into two boules. Generously rub two dish towels lined 9 inch bowls with a wheat and rice flour mixture. Tighten up the boules and place them, seam side up, into the towel lined bowls. Cover with plastic wrap and refrigerate immediately. 12 hours later, preheat the oven to 475 degrees F, and place two heat proof Dutch ovens in your oven. If you only have one pan, leave the other loaf in the refrigerator while the first one bakes. When you are ready to bake, cut some parchment paper into two 9 inch by 15 inch pieces. Remove the Dutch ovens from the oven and remove the tops. Working with one loaf at a time, remove the plastic wrap, place the parchment over the dough and place a plate over it. Flip the dough over, remove the basket and floured towel, and lift and place the loaf in the Dutch oven by using the parchment as a sling (leave the paper under the dough). Score the dough and then cover the Dutch oven and place it in the hot oven. Repeat with the second loaf. If you are using the Lodge combo cooker, use the lid on the bottom and the larger pan on top. This makes it much easier to maneuver with the parchment paper. Bake covered for 20 minutes, and then remove the Dutch ovens from the hot oven, uncover, and place the loaves on a baking sheet. Place the baking sheet into the oven, reduce the heat to 435 degrees F, and bake for 20 to 30 minutes more, until the interior of the bread reaches 205 to 210 degrees F and the bread is a deep brown. Cool loaves completely on a wire rack before slicing. Welcome to Progressive Eats, our virtual version of a Progressive Dinner Party. Each recipe in our menu this month features figs and our host this month is Coleen who blogs at The Redhead Baker. If you're unfamiliar with the concept, a progressive dinner involves going from house to house, enjoying a different course at each location. With Progressive Eats it’s a virtual party. A theme is chosen each month, members share recipes suitable for a delicious meal or party, and you can hop from blog to blog to check them out. Come along and see all of the delicious dishes featuring figs! I would love to taste ANY of your breads! 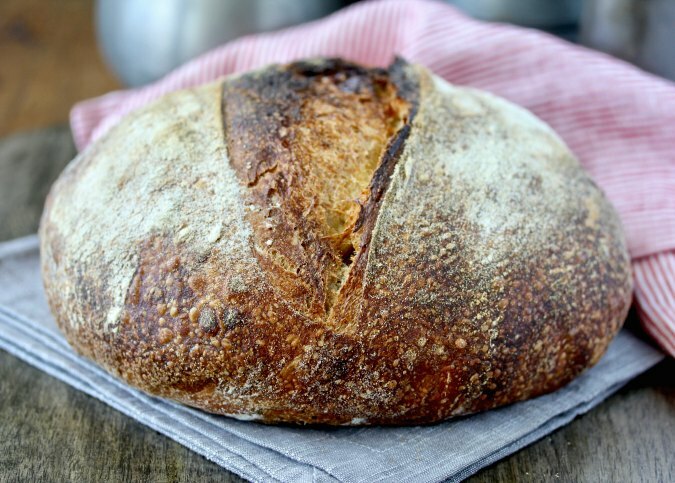 This fig sourdough sounds incredible! His blog is fabulous, isn't it? Absolutely gorgeous and mouthwatering!! Beautiful baking - fig and sourdough is the perfect match! I know I'm late to get here but better late than never right and I knew I would just LOVE this bread Karen. It looks delicious both inside and out! This bread looks absolutely perfect! I love fennel and I really should cook with it more often! Both fennel and the seeds. Oh my goodness, not just sourdough but sourdough with figs....be still my heart. You made me smile Wendy. What incredible flavors! That's a gorgeous loaf of sourdough! My poor sourdough starter definitely drew the short straw at my house. It wants to come visit you! Your breads are always fantastic and this flavor combination sounds so good! I just love the flavors you've got going on this bread! Unique and tasty! 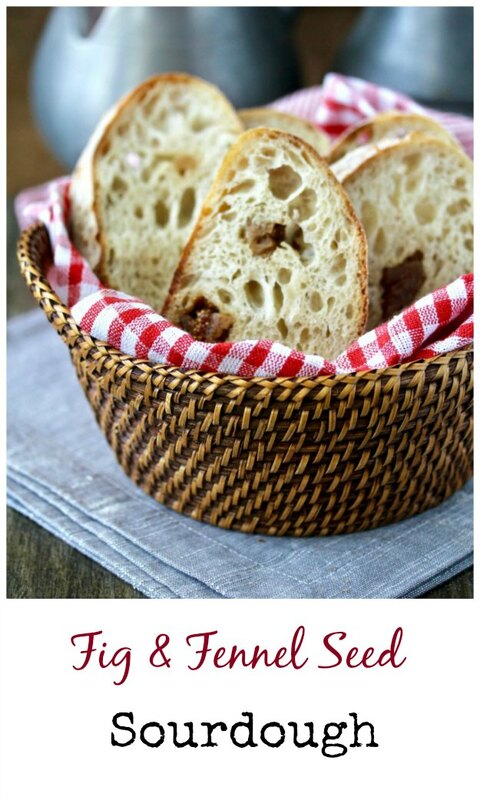 i just made some sourdough bread once it's gone, I will be making this!